About three weeks ago I finally had the opportunity to connect in real life with one of my favorite Persian bloggers who I came to know through Instagram a while back. 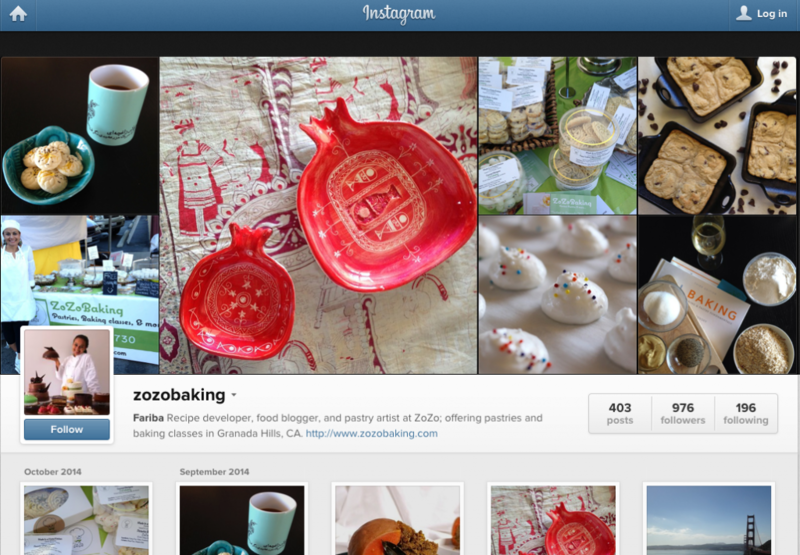 I was immediately drawn to Fariba and her delicious Persian sweets that she posts on both her Instagram and website Zozo Baking. Fariba and I decided to meet in Westwood for breakfast on a warm September Sunday morning. 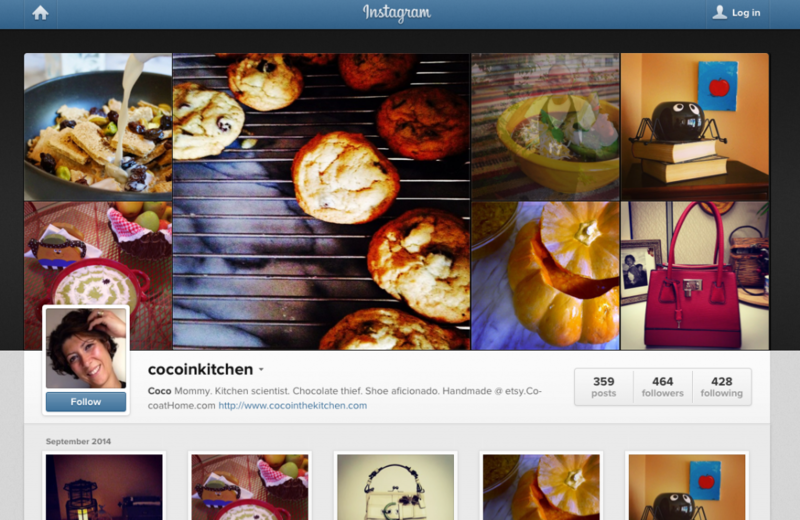 She also invited Colette from Coco’s Kitchen to join our outing. Our get together was all around delicious both in company and food. When looking at the breakfast options at Pink Orchid I knew immediately that I was going to get their “Persian Summer Breakfast.” How can you pass up the plate above? Seriously! It had “HAPPINESS” written all over it. 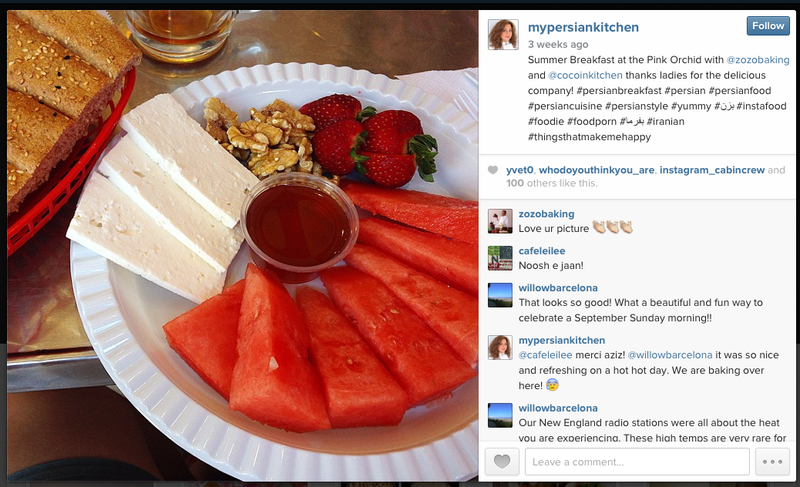 The plate had slices of watermelon, Feta cheese, walnuts, honey, strawberries, and a basket of whole wheat Barbari bread. I have professed my love here on the blog about how much I love the combination of Watermelon and Feta. In fact, I have posted about Feta Cheese with Bread and Watermelon, as well as the amazing Watermelon & Feta Cheese Salad. 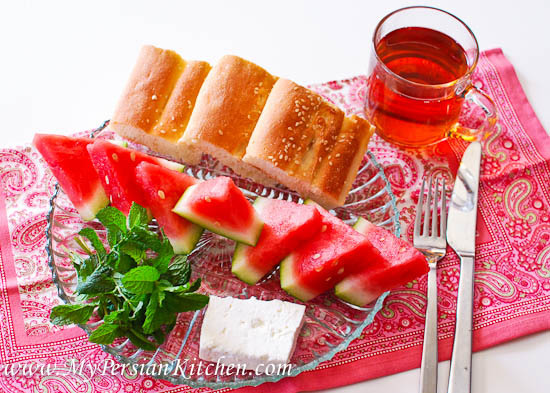 Back to the Persian Summer Breakfast…it was deliciously refreshing on a hot summer day. Of course it all had to be washed down with a hot cup of Persian tea, because there is no other way, even on a hot day! Over the weekend I decided to take my most favorite elements of Pink Orchid’s breakfast and make my own version at home. 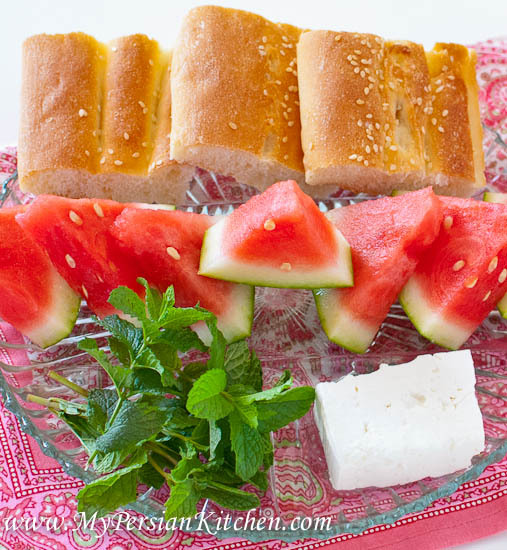 So I created my breakfast plate with slices of seedless watermelon, Feta Cheese, fresh mint from my garden, and warm Barbari bread. It was absolutely a perfect and delicious breakfast! Try and let me know what you think of it! Sanam joon, thank you for the kind words and what a lovely post.